I was recently in India on my first expedition to this beautiful country. And what I explored were not just amazing monuments and landscapes, but something which has put India on the international Birding Map. In the one month I spent here in 2012, I went birding for 12 days to the North East through Asian Adventures who are experts in experiential tourism. And my journey below in text and images will reveal how well the trip was conducted. The trip began from Guwahati in Assam via Delhi where we landed the first day of the trip. And we were straightway escorted to the Nameri Tiger Reserve where we to enjoy the next two days amid nature, birds and cozy, well-equipped, tented camps. We saw Spotted owlets at the property itself. But the real adventure here began with river Jia Bhoroli. The aim was to enjoy the wild, walk through little-trodden paths, and enjoy the sights in completely non-orchestrated conditions. And we followed the calls of the great Indian hornbill. And a walk into the deeper reaches of the reserve in two days revealed the -throated barbet, orange-bellied leafbird, Spot-winged starling, brown-capped pygmy and lesser yellow-nape woodpeckers and a red-breasted parakeet. We would raft ride, have boat fun, walk and do what not, just to get a glimpse of amazing birds of the region. No wonder, we even captured the rare elusive White Winged Wood Duck in our camera along with some 250 other species! The days here would culminate into cultural evenings organized by locals of the region at the bonfire. An out-of-the-world experience. The next three days were dedicated to spending quality time with birds at the Lama Camp and Bompu. My most favorite memory of the region would always be bamboo thickets amid high altitude alpine forests where we captured some 50 species! There were Temminck’s and Blyth’s Tragopans, Hodgson’s frogmouth, Yellow-bellied flowerpecker, Golden Bush Robin, Lemon-rumped Warbler, Grey Treepie and Yellow-throated Fulvetta. Time just flew in these three days spent amid nature and birds. But it wasn’t the end! The finale was the icing on the cake. We were heading to Kaziranga National Park – the land of the one horned Rhino. Not many know that the park has about 478 bird species including residents and migratory birds, making it a prime birding spot of India. 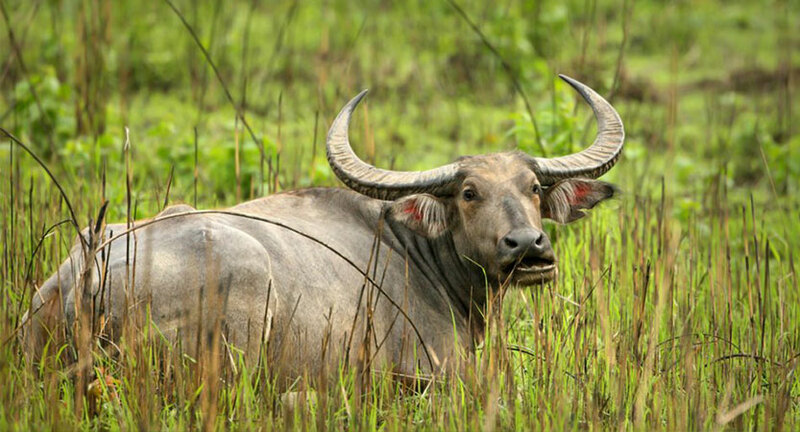 The lush green vegetation of Kaziranga is home to the most fascinating birdlife in Asia. The park is divided into four zones, namely Central, Eastern, Western and Ghorakati range. And we had a great time spotting birds like Spot-winged Starling, Swamp Francolin etc. A walk towards the huge Brahmaputra river revealed the most fascinating ones – like Lesser-white Fronted Goose, Bear’s Pochard and Ferruginous and forest birds like Blue-naped Pitta, Green-billed Malkoha, Black-breasted Parrotbill etc. In the interiors, we also saw many one-horned Rhinos and Pompadour Pigeon, Wreathed and Great Hornbills playing and flying around them or amid the forests. The delight of the days spent here was the rarely spotted dollar bird, Chestnut-headed, Blue-bearded Bee-eater and Daurian Redstart. Ah, what an experience. The best part of the tour was our guide, who knew each bird inside out! And ensured we missed no spotting. Thanks to him we even spotted Pratincoles and various barbets. And also did some Owl spotting near our lodge at Kaziranga before retiring for the final day. On the final morning of our day-break’s birding trip, offered us great shots of Asiatic Water Buffalo, Swamp Deer and Hoolock Gibbon as well.